All services from Fishguard and Goodwick are displayed live here on the right, and on every page of Fishguard Trains. Today’s departures are in the brightly coloured column. When the next departure is within 10 minutes, the time displays red on black. Click on any departure time for detailed information. Click once again to return to main timetable. Times in green boxes – westbound to Fishguard and then Ireland. 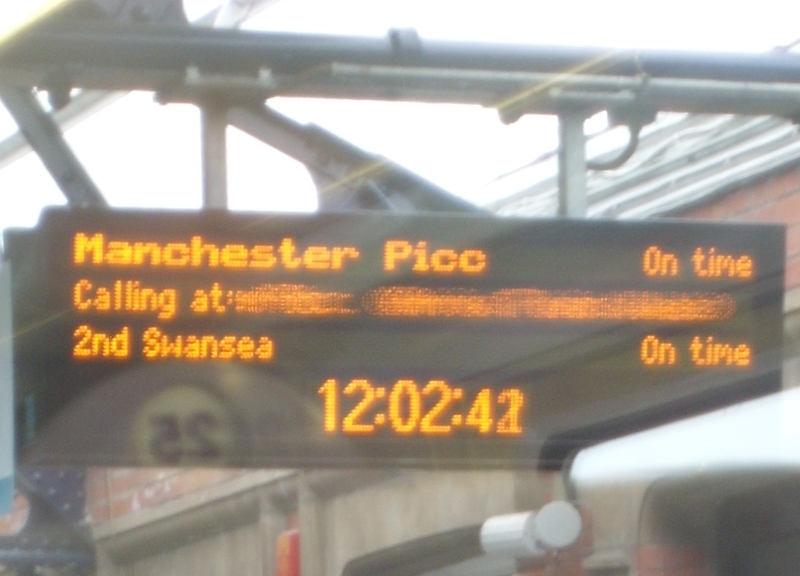 Times in yellow boxes – eastbound to Swansea Cardiff and England. Services from the new station start with the new summer timetable. Click here for Fishguard Trains’ new bookmark timetable: At a glance, all trains to/from Fishguard and Goodwick. Published in 2011 for the launch of Fishguard’s new rail and bus services, Fishguard and Six Nations is small enough to fit your pocket, big enough to take you across Europe. Combining rail, bus and ferry times into one easy-to-use timetable, Fishguard and Six Nations helps you cross Pembrokeshire, Wales, Britain and well into continental Europe. Whether your journey is from Fishguard to Cardiff, Goodwick to Glasgow, Dinas to Paris or Newport Pembs to Newport Gwent, this timetable covers the world of public transport opportunities that now open up from Fishguard. Fishguard and Six Nations has the final train timetable revisions, rail connections through Wales, England, and into Scotland and through the Eurotunnel, ferry sailings to and from Ireland, and the connecting bus services between Fishguard Harbour, Goodwick, Fishguard Square, and onwards to Dinas, Newport and Cardigan. It shows how far you can travel in a day from Fishguard, but also reveals local opportunities: travel between Fishguard and the south of our county has become easier. Milford Haven and Tenby are now more accessible to and from North Pembrokeshire. And Cardiff Airport is now only three hours away by train. The first edition of the Fishguard and Six Nations timetable is generously sponsored by printers Phoenix Press of Goodwick, and supported by Seaways Bookshop of Fishguard. The current version (1.02) with the latest revisions to connecting bus times from September 30th onwards, is valid Monday-Friday until December 12th. These links open pdf files for outward and return trains. Print return trains on the reverse side. Fold in half so that outward trains are inside the fold. Then fold each half page in half again in the opposite direction. That makes a three-fold concertina. Finally fold the concertina in half to display the Fishguard Trains box on one side, and the FISHGUARD AND SIX NATIONS heading on the other – see the photo above. – bus replacement times here. 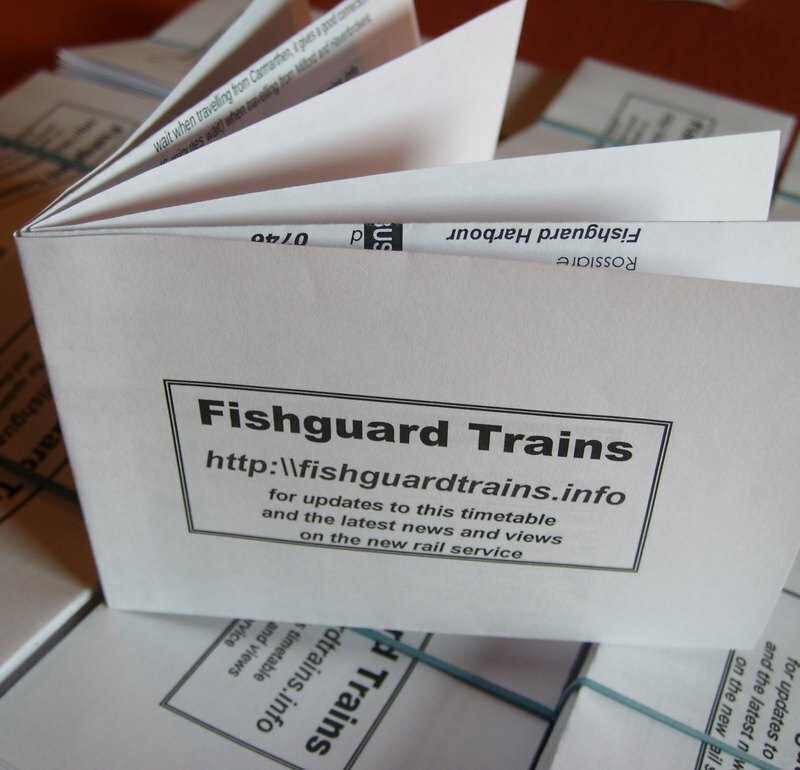 Fishguard Trains updates and revises the timetable online as required. Version 1.01 showed the temporary bus shuttle between Fishguard Harbour and Fishguard Square. The current version 1.02 shows the amended 410 bus service that replaced the temporary shuttle on September 30th. Note that the bus times changes on September 30 are not all for the better. Trains between Rosslare and Dublin have been retimed to connect with ferries (you would have thought it was obvious). Here is the full timetable. Pre-launch bus links between Fishguard Square and Fishguard Harbour station. Network Rail has had repeated problems publishing Arriva’s times for the 15:14 from Cardiff Central to Fishguard arriving 18:34. Follow the story here. Well done SPAD, very well presented timetables. Without Fishguard & Goodwick station though only the 13:15 Town Hall -> Harbour bus is any use in bad weather as the walk from Goodwick is a bit much to ask of passengers unless it is a nice sunny day. The 13:25 Harbour -> Town Hall 410 is probably too tight to be a real connection, unless it is held for arriving train passengers. Still, essentially if the weather is bad and you haven’t access to a car/taxi/lift the rail service might as well still be 1 train per day. Fishguard & Goodwick station would of course change that. I am working with Pembs.County Council to sort out the provision of buses to meet the new trains. Also to have Goodwick station open as soon as possible. Try Monday the 12th of September between 09:15 and 10:00, with a ceremonial send-off for the 09:55 train service. Parking at the Harbour will also be free on that day apparently. So lets all get down to the Harbour to show the Welsh Transport Minister, Carl Sargeant how much we value the extra trains, and to listen to Moria’s Harp. I wonder who we can get down to do the opening ceremony for Goodwick station, hopefully later this year?…………….. It also contains times for diverted Richards Bros services starting at the very end of the month. Should have said, thanks to Swansea Jack and anthony215 over on the railway fourms for bringing that to my attention. Will buses originating from Cardigan via Newport be run so as to meet all trains leaving and all trains returning to London? It frustrates me (and many others), that people would be more inclined to use buses that allow people to use all the trains provided. It makes perfect sense to integrate these. I am sure people from Cardigan all the way to Fishguard if made aware would use these service thereby meeting the provided trains which will only contribute to the retention of the trains after the trial period. Connections between Newport and places between there are Fishguard wouldn’t be too bad if there was a bus up from the harbour connecting the 20:30 train arrival to the 21:05 bus depature, which sadly it doesn’t look like there is (I’m using this site’s Fishguard & Six Nations timetable). As it is, last departure from Cardiff for them is the 16:04 to Haverfordwest and get the bus back from there (doesn’t help useage of Fishguard’s new train services.) Some of the buses that have been put on are just part of the town service, so you have to change at Fishguard Town Hall for the 412 Cardigan – Newport – Fishguard – Haverfordwest buses sometimes. If you are in Cardigan, it is the same 16:04 last departure from Cardiff, for arrival in Carmarthen at 17:53, just in time for the 18:05 last bus from Carmarthen to Cardigan. However, if you are north of Newport but south of Cardigan you are stuck. I wrote a lot more for this comment, but some of it I’ve said elsewhere on this site anyway and I thought I should e-mail SPAD about part of it too, so I’ll leave it there for now. I just read the timetable, and I see for the most part buses are in place, although one in the morning cuts in fine by a few minutes! I cant get the link to work for irish rail. Ive checked the website. Cant see any changes to the 1430 fishguard service that gets you to Rosslare at 1800 and the Rosslare train leaves at 1755 for Dublin. Well thats Really well planned. CAN I get from Oxford to Fishguard return TICKET BUS OR TRAIN on Tuesday 24th September to meet someone at the boat from Ireland. HOW FAR IS Cardiff from Fishguard? So the answer is, yes, you can meet your visitor off the midday ferry, leaving Oxford at 8:35. You did mean that one, didn’t you, not the midnight ferry? How far is Cardiff from Fishguard – about 100 miles. And quicker by train! Quicker by train? Carmarthen to Cardiff is 1hr 33mins on the boat train at the moment (although 1hr 25min should be possible), and I think the fastest service via Swansea is 1hr 41min. The AA journey planner says it is 1hr 19min to drive (or 1hr 16min to Cardiff Gate Services rather than central Cardiff). Of course, the AA journey planner could be a little optimistic, meaning there would not be much in it if you are using the Swansea District Line to get a 1hr 25min Carmarthen – Cardiff journey time. Via Swansea though, rail’s had it. Fishguard Harbour to Carmarthen is quicker by train though, and if you are lucky enough to be on the boat train (no tedious going into Swansea) the rail journey between Cardiff and Fishguard is MUCH nicer than the road journey. Taking a look at today’s (Friday 13th September) 10:57 Cardiff to Fishguard Harbour boat train on realtimetrains.co.uk I noticed that the service waited about 5 minutes at Llanelli as it was early into the station and another 5 minutes at Whitland for the same reason. The service obviously had a clear run throughout and didn’t need recovery time. If it was a class 150 as usual then it does suggest that if the service was booked for a faster class 158 there would be the opportunity to cut at least 10 minutes from the journey time, while still retaining recovery time. Class 150s are 75mph trains while a portion of hte Cardiff – Fishguard route is capable of 90mph running. I suspect the huge gap is down to shortage of rolling stock and a lack of will and funding in government to do something about it. The community survey did ask some questions about filling that gap, but obviously the responses weren’t sufficient for the governement to justify increasing the funding as opposed to renewing it the same level, which I assume is what has been done. The gap is certainly a shame as is the poor service on the Heart Of Wales Line (HOWL) (although in that case some of the remote halts probably don’t require more trains, but the main towns on the route deserve far better in my opinion). Talking of HOWL, why don’t we have a marketing name like that? England has the Robin Hood line etc. Even ‘Conwy Valley Line’ is more of a name than ‘All Points West’, the community rail partnership (CRP) for the lines west of Swansea. Incidently, that seems to be no more. How about calling either Fishguard’s or Milford’s the ‘Lansker Line’, perhaps with a new CRP, called the ‘Lansker Line And Branches CRP’, to replace the defunct ‘All Points West’? I note that Goodwick rail station is not shown on the T5 timetable at 18.40 and 20.32 although in each case the bus pulls up at the bus stop outside the station! I have used both in the past few months and very convenient the buses are. This gives the impression that there is no connecting bus service to Newport, when, of course there is. This seems a simple matter to correct in printing the timetable. The 09.57 rail service to Carmarthen and beyond does not have a connecting bus service. Is there any good reason why the 09.40 from Fishguard Square could not proceed to the Harbour entrance roundabout, turn around and stop at the bus stop opposite Tesco, before proceeding up the bypass and onto Scleddau? This would provide a passable connection to the 0957 service, with passengers having to walk 100 yards only. I estimate it would add five minutes to the bus timetable, with no effect on connecting with a train at Haverfordwest. These three improvements (two cosmetic) would demonstrate a connected-up, integrated transport service.